Came back yesterday from Euro Auto Fest in Greenville, SC. 300 car entered, about half German and half Italian / English. About 10 BMWs in "Group 1" (Vintage). An Isetta (not pictured) won class. All in all a good show. I got interviewed by Keith Martin along with 3 other owners about their car and their respective investment potential. Several folks from The Vintage were their - a mint bristal 1600, and Don (black targa) brought an e9. 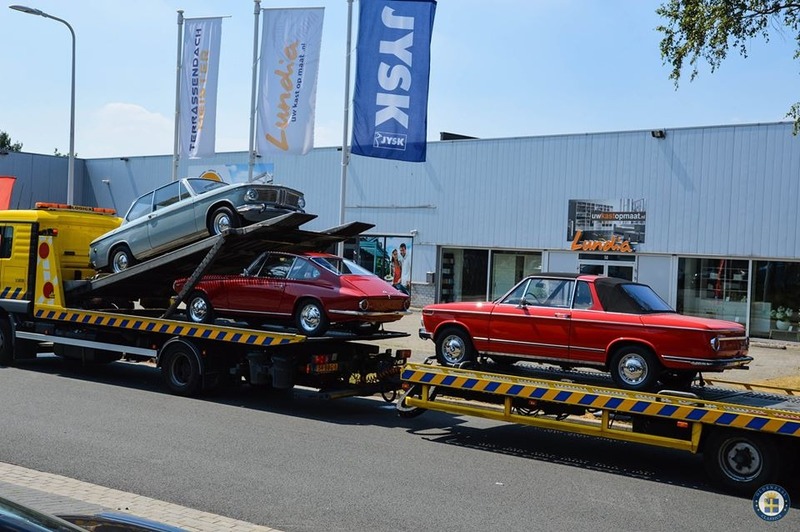 And a new to the states, baur cabriolet that was just brought in from Italy (via the broker in NL) two weeks ago. Best part of the show was that the tii behaved itself. 400 miles round trip with now warm up regulator issues, coolant leaks, and fuel leaks. A month ago I was certainly wondering if I was in over my head and ever going to not not only get the car back together, but actually get it running decently again. Only disappointment was getting just 20.5 mpg, I thought I'd do better (but then again I was above 70 mph for well over half the trip and touching 80 / 90 for thirty minutes or so out in the open). Nice write up David. I cant believe I missed it this year without even having it on my radar. I've never been but only live 2 hours from the event. Hi David, congrats on your successful trip, and thanks for posting! Do you have any other information on that Cabrio Targa by Baur? I could not read the license plate, but any info would be helpful. I had heard a rumor of an impending Baur arrival, bu this is the first I have seen of it! We are trying to catalogue all the Baurs in the US. Thanks in advance! Do you have any other information on that Cabrio Targa by Baur? Don who owns the black Baur which is at the Foundation right now knows her. That's a '72 Baur brought in by Fran and Scott Hughes to add to their amazing collection. Fran's bday present. It's a one-owner car that lived its life in Rome. Sold by Oldenzaal. Lots of details to sort out but they're enjoying driving it. Bristol 1600 belongs to Stan Horton from Atlanta. Original and only owner. Kissed a guardrail on the way to The Vintage 2 years ago but good as new now. And David, your survivor tii is an inspiration. Great catching up with you! Hi David, hi Don, I was the Mint 2002 on the other end of the line. Unfortunately I didn't get a chance to chat with you guys as we spent the whole day chasing the girls around the place (and consequently had to break the rules a little and left early when they were well and 'done'), but still made for a great family outing! As much fun as bringing the whole family in the 2002 was, think I might try to convince the wife to drive the chase car to leave outside the gates next year. Anyway, I'll make sure to seek you guys out at the Vintage this summer to catch up! @dbower Don if you're coming, maybe we should caravan! I'm right next door in Lawrenceville! (I can't find the photo of my high school daughter driving the car in the 4th of July parade with her younger brother throwing candy out the window to the on-lookers). Don't know if he told you, but Keith Martin loves 2002s. He bought one from me about 6 years ago - a '73 Tii in its original color of Turkis. He's quietly looking for another one, if he can find a great deal, as he gave up the Turkis car when he and his wife split. Now she's showing it.